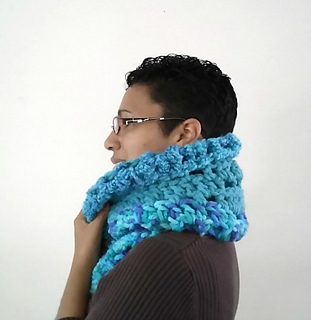 The Super Chunky Super Warm Scarf is just that, super chunky and super warm. 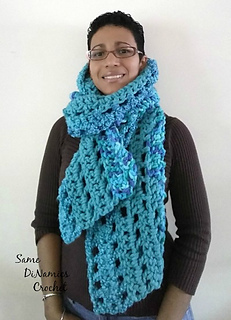 When I finished the scarf and tried it on, I felt like as if I was getting the warmest and softest of hugs where I felt comfort. Surprisingly enough, it’s not heavy. This is due to using a bigger hook creating more open stitches that makes the piece more pliable and with more drape. Yarn: Red Heart Mixology Yarn - Calypso Print, #6 Super Bulky, Jade (Solid), Calypso Swirl. 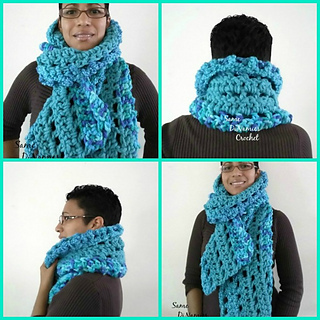 194 yards total for finishes scarf. Hook: 11.5mm/P, or hook to obtain gauge. The hook I have says 11.5, not 10 but it is listed as a P as well. Size: 64” x 9.5”. To make scarf shorter or longer, chain a multiple of 10 plus 2. 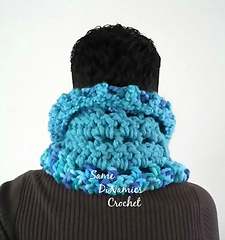 Special Pattern Notes: Ch3 counts as a double crochet. Join new yarn either at the end of a row, or when one skein runs out. 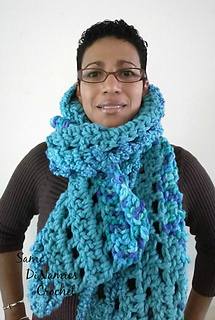 The difference in yards of the the 3 yarns, creates a piece that is asymmetrical in color changes and unique. I joined my new yarn when the previous skein ran out, which was in the middle of a row.